Q - "Is there a way to import photos from iPhone X to PC without iTunes? I got my iPhone filled with valuable family photos, videos, and music. I want to sync my iPhone photos to Windows 10 for backup without any of them to be deleted. " Photo transfer from iPhone to PC can be done in multiple ways, traditionally through iTunes, which however is sort of the way most people take pains to avoid. That's why we prepared here best 3 ways of iPhone photo transfer without iTunes. The most recommended one is to use WinX MediaTrans, a photo manager software, for its ease of use and fast syncing speed. Transfer a hundred 4K pics in 8s only! If iTunes is more of a nightmare to you, then the biggest reason for using WinX MediaTrans will be that it is a stand-alone iPhone file manager that requires no iTunes. To be precise, it is the ONLY software in the market that allows you to ditch iTunes and its components all together while transferring files between iOS devices and PC. Transfer photos from iPhone to PC; sync pictures from PC to iPhone. Support photo transfer in JPG/PNG/GIF/BMP/TIFF/HEIC (HEIF) formats. 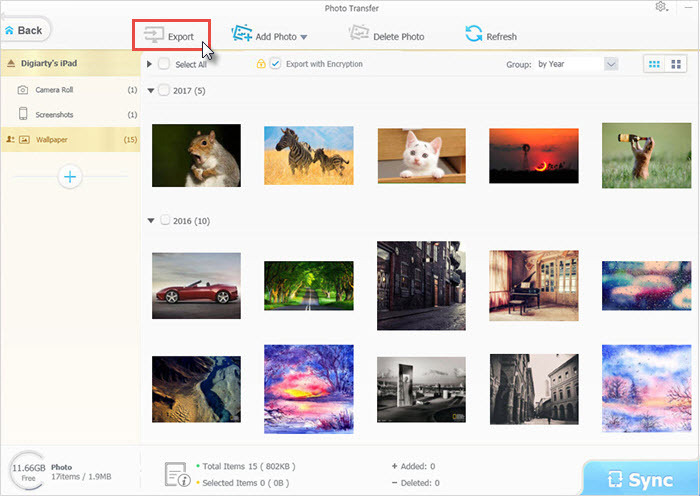 Manage pictures in day/month/year; transfer photos selectively. Export HEIC to JPEG; sync videos, music, eBook, ringtone, etc. 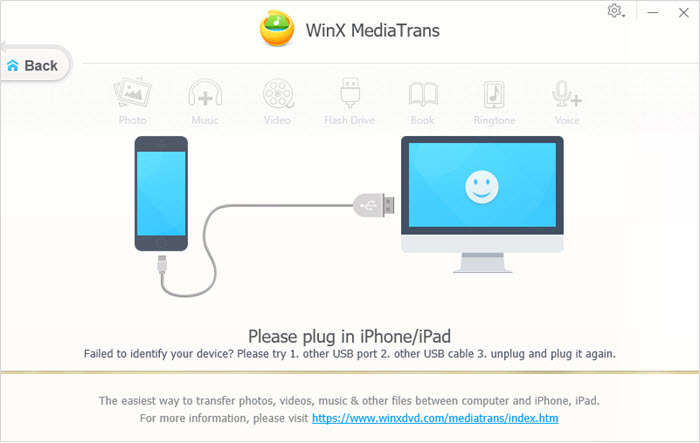 How to Transfer Photos from iPhone to Windows PC with WinX MediaTrans? 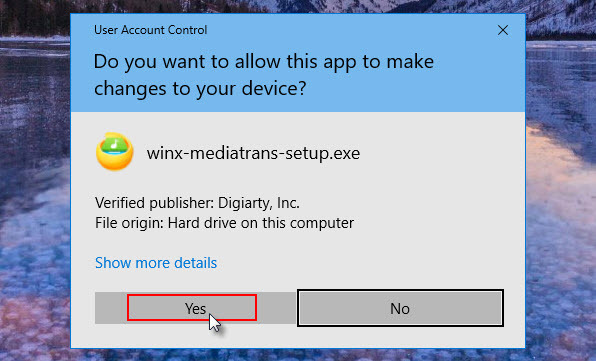 Step 1: Download WinX MediaTrans .exe file on your Windows 10/8/7 computer and install this photo manager iPhone X (iPhone Xs/Xs Max/Xr/8/7) by checking the "End User License Agreement" box and clicking "Install" directly. Or you can choose "Custom Installation", browse to set the file location and "Install Now". Step 2: Connect your iPhone to PC, better using an original Apple iPhone USB cable. There pops out an alert box, suggesting you to adjust iTunes settings to prevent data erasing automatically. Step 3: Click into Photo Transfer on the WinX MediaTrans main interface and you will see all photos on your iPhone grouped by day, month or year (totally up to you). Select photos you want to sync to PC, click Export, and it's done in a wink. • No matter how many photos you are transferring from iOS devices to PC, the syncing speed of this iPhone to PC transfer software is blazingly fast. Tests show that transferring 100 4K iPhone pictures takes only 8s. • Better still, it supports transferring videos, music, ringtone, ebook, Podcasts, etc from iPhone to PC and vice versa. Video conversion capability embedded in this iPhone photo manager software is really a big surprise and will surely facilitate you a lot. Windows 7 - An AutoPlay box will appear the minute you connect your iPhone with PC. There you can choose "Import pictures and videos", adjust the location path or not, and then transfer all photos from iPhone to PC Windows 7. Note that there is no option for selecting photo folders. 1. Connect your iPhone with Windows 10 PC through USB cable. 2. "Photos" app would pop up automatically. 3. Remember to unlock your photo to allow data access. All photos will be loaded, and you just need to scroll down to select pictures. 4. 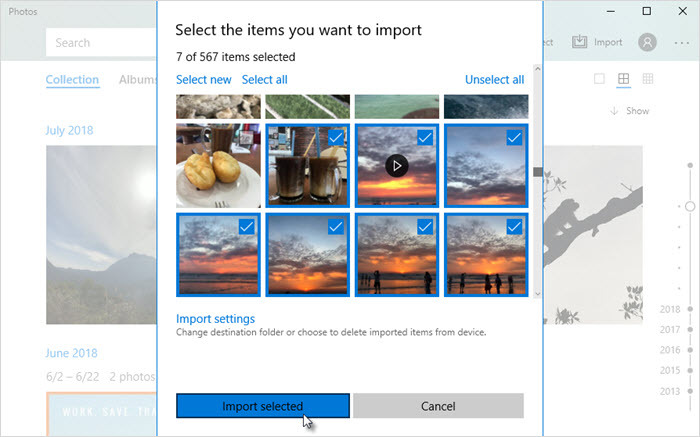 Press "Import Selected" button to start transferring photos to Windows 10 PC. 1. 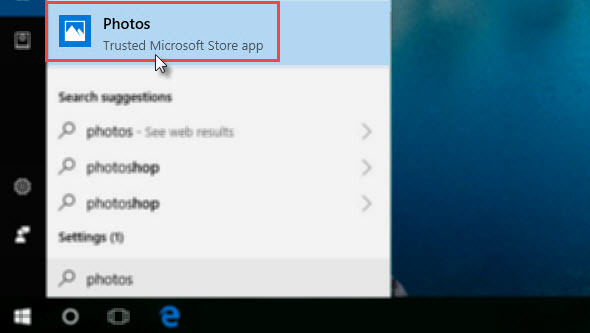 Type and search "Photos" app in Windows 10 Cortana and click to open it. - Or search and click into "Phone Companion" in Cortana and click "Import photos and videos" in the bottom left corner. 2. Go to "Import" in the top right corner. Click it and you will see two options in the drop-down menu. Choose "From a USB device" and it starts auto loading photos on your iPhone for transferring. Compared with iTunes, iCloud is much better for iPhone photo backup and transferring to PC. The whole backup process is done almost unconsciously anytime there is wireless network or you charge the phone. 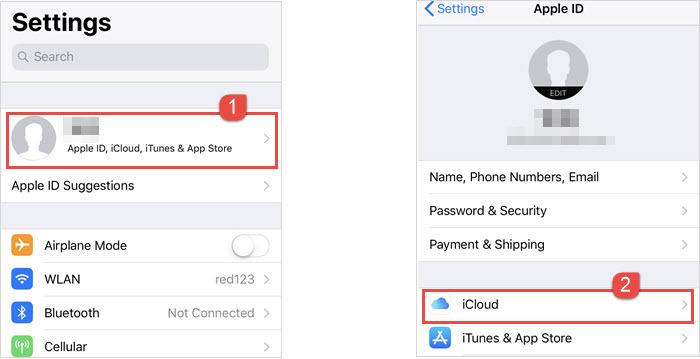 Using WiFi, you can transfer photos from iPhone Xr/Xr Max/8/7 to iCloud Photo Library with no efforts, and then access icloud.com and download iPhone photos to PC. How to Transfer photos from iPhone (iOS 10.3 or later) to PC via iCloud? 1. Go to "Settings" and click your name to get into Apple ID interface. 2. Find "iCloud" and click to move on. 3. Click "Photos" under "APP USING ICLOUD". 4. Then turn on "iCloud Photo Library". Note: When backup and transfer iPhone photos to PC via iCloud, don't disable iCloud Photo Library on a whim, which may erase all your pictures. 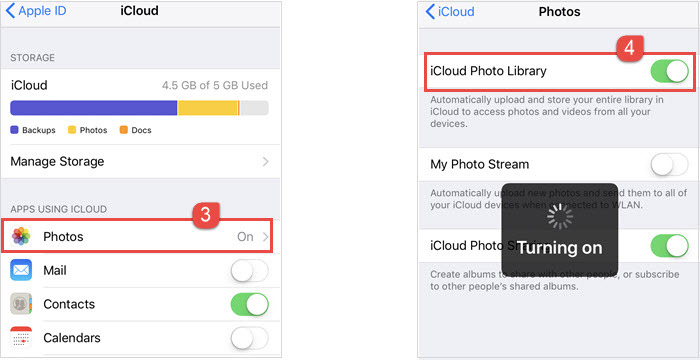 If you go to "Settings -> Apple ID -> iCloud -> Storage -> Manage Storage -> iCloud Photo Library -> Disable and Delete" on iPhone, then your photos backed up to the cloud will be deleted as well. • 5GB free backup storage. 5GB is far from enough to backup UHD photos in 4K resolution or large raw file, let alone music and 4K videos. You do have a plan B - pay to get more storage monthly: $0.99/m for 50G and $2.99/m for 200G. • iPhone photo to PC transfer only happens when you have an internet connection. • iCloud Photo Library is more like a syncing service than a backup method. You delete a photo from iPhone, then it will also be removed from iCloud. It seems like there is no backup. People are worried about things like "if I disable iCloud photo library on my iPhone, will it remove all photos on other iDevices?" Everytime you transfer photos from iPhone to PC or disable iCloud photo library, you may think about it over and over again to prevent photo loss. If you have such troubles, WinX MediaTrans is the best alternative to avoid such errors and make safe photo backup. For example: iTunes runs slow, iTunes keeps crashing, iPhone won't connect to iTunes on Windows PC, etc. You can imagine that transferring photos from iPhone to PC using iTunes would be full of twists and turns. There is no problem to import pictures from PC to iPhone with iTunes, which however doesn't allow you to download photos from iPhone to PC probably for privacy protection. FYI, photos downloaded from PC to iPhone can't be deleted, which is not convenient for managing photos on iPhone and will eat up space. It is so complicated and time-consuming for noobs of tech things to find out where the iPhone backup photos are stored on PC. And you cannot open the file even if you find it, because there is no file extension, and your engine can't figure out what app should be used to open it. You may have set HEIC as the format for photos on your iPhone for space saving. And sometimes, another requirement happens: to transfer iPhone HEIC photos from to PC for a backup…Now, follow us to complete iPhone HEIC photos transfer with ease. Here's a guide of how to transfer Snapchat photos from iPhone to PC for making a copy of photos shot by Snapchat on Windows (10). How do I transfer WhatsApp photos/pictures from iPhone 8/7/6s to Windows (10) PC? Go through this tutorial to know how to do so easily and safely.